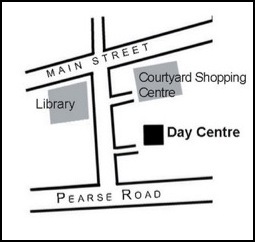 At present we meet in the Day Centre off Oliver Plunkett Road. Here's directions to where we meet in Letterkenny should anyone want to come along some Sunday morning. It would be great to see you. If you're passing through on holidays or whatever you'd also be welcome to drop by. Coming into Letterkenny from the Dry Arch roundabout go straight on at the next two roundabouts. This will take you up to a set of traffic lights at Main street. Going straight over and down Main street, you pass the square on the right (small area with a bandstand). Take the first road on the left after the square (just before the library). Take the second road off it to the left and the Day Centre is the single storey building at the end.